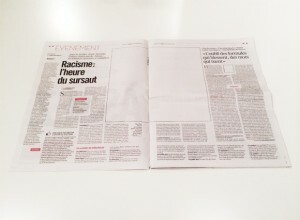 Joni Mitchel sang, “You don’t know what you’ve got till it’s gone.” It appears writer Amar Toor absolutely agrees as he revealed in his article in the Verge, “French newspaper shows power of photography by removing all images.” The title about says it all. 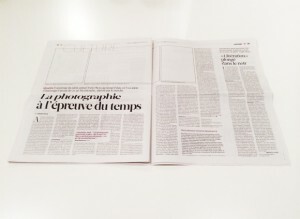 To demonstrate the power of photo journallism, the newspaper Libération simply removed all photography and left sterile, blank boxes surrounded by keylines to show their readers exactly what they were missing – and where. “In their place: a series of empty frames that create a form of silence; an uncomfortable one,” Ollier continues. “It’s noticeable, information is missing, as if we had become a mute newspaper. 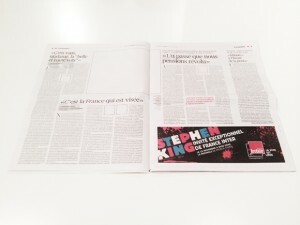 [A newspaper] without sound, without this little internal music that accompanies sight.